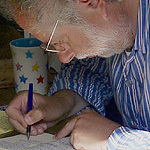 Robert Jones published More About the Weather in 1989, and, after selling most of the print-run, offered to bring out a limited edition of the new poems I was writing in Japan - poems such as 'Lost Objects', composed during the two years I spent in Kyoto, about the disorientation of an initial encounter with a different culture. This interim collection contains seventeen pieces, fifteen of which were later included in Lost and Found, as well as a brief afterword essay by Peter Swaab. 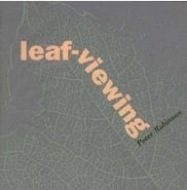 Despite being a small press publication, Leaf-viewing was given a notice in the London Review of Books by Nicholas Tredell in which he wrote that 'Robinson...joins a line of expatriate poets which includes Empson and Enright. The challenges for such a poet are threefold: how to negotiate with cultural difference - an especially complex problem today, when Eurocentrism has been strongly challenged; how to relate to the world he has left; and how to distinguish himself from his poetic predecessors. Robinson meets these challenges with tact and skill.' It was on the strength of this book especially, that John Ashbery, writing in the PN Review, included me in a list of writers he admired: 'We know about "strong" poets. Attention must now be paid to the "curiously strong" like...Peter Robinson'.